Robert Howard is the real deal. The Bergen Catholic junior is on the heels of a 2017-2018 year where he collected some major hardware. And he how has one more accomplishment to tout. He announced yesterday on Twitter his decision to commit to the top-ranked collegiate wrestling program, Penn State, for legendary head coach Cael Sanderson. Howard is the No. 1 nationally-ranked wrestler at 126 pounds and the No. 3 ranked prospect in the Class of 2020, according to FloWrestling.com. Howard went 26-0 during his sophomore campaign, won his first state championship at 120 pounds and grabbed the gold medal at the Youth Olympics this summer in Buenos Aires, Argentina. Jersey Sports Zone was on hand last season as Howard helped Bergen Catholic topple Blair Academy to win The Who’s No. 1 Duals title and for his state title win in Atlantic City. Like seeing highlights of the nationally-ranked Bergen Catholic wrestling program? 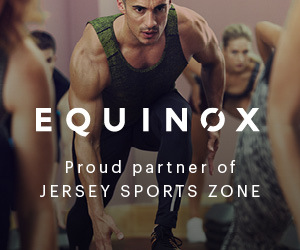 Thank Equinox Fitness. They’re the reason Jersey Sports Zone travels around the state to watch the Crusaders hit the mat.